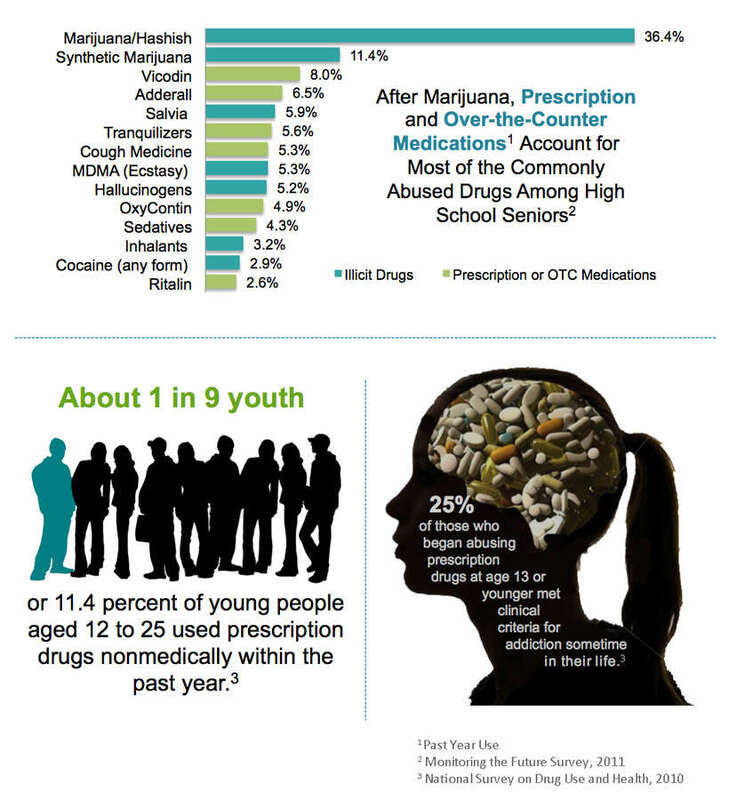 Top Graph: Past Year Drug Abuse Among High School Seniors Graph. After marijuana, prescription and over-the-counter medications account for most of the past-year use of commonly abused drugs among high school seniors. Data for past-year use of prescription and over-the-counter medicines include the following: Vicodin (8%), Adderall (6.5%), Salvia (5.9%), Tranquilizers (5.6%), Cough Medicine (5.3%), OxyContin (4.9%), Sedatives (4/3%), and Ritalin (2.6%), a combined total of 37.2%. Data for past-year use of illicit drugs includes the following: Marijuana/Hashish (36.4%), Synthetic Marijuana (11.4%), Salvia (5.9%), MDMA (Ecstasy 5.3%), Hallucinogens (5.2%), Inhalants (3.2%), and Cocaine (any form, 2.9 %).